As Cheshire West and Chester experiences some of the coldest temperatures this winter, the Council’s Highways teams have moved up a gear to keep the road network running smoothly. The Council's Highways Service and its maintenance contractor, Ringway, have been working round the clock to cope with the recent cold weather and their fleet of 14 gritting trucks has been mobilised four times in the past 24 hours. 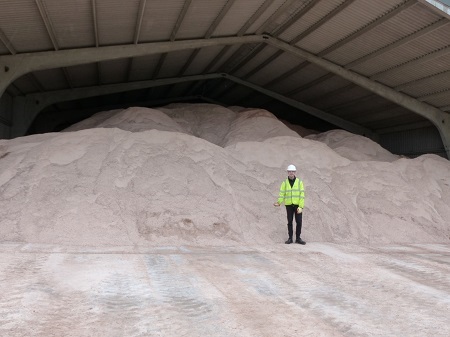 The fleet keeps 490 miles of roads safe for drivers using the 6,000 tonnes of rocksalt stored at the Guilden Sutton Depot to treat key routes across the borough. Primary routes are gritted first which include A roads, other main roads and routes used by the emergency services. In periods of continued bad weather secondary route are sometimes gritted when the primary network is fully treated and if resources are available. On nights where frost or icy conditions are forecast, the fleet will spread salt to prevent ice from forming across 40 percent of the Council's highway network. All gritters are equipped with GPS tracking to enable accurate monitoring of which roads have been treated. Duty officers will mobilise the gritting fleet when it is predicted that road surface temperatures are to drop below freezing, allowing time for the salt to be applied to the road. Salting is normally completed within four hours and usually before 7am. The Highways teams maintain a close relationship with the Met Office, which monitors roadside weather stations and produces localised forecasts. 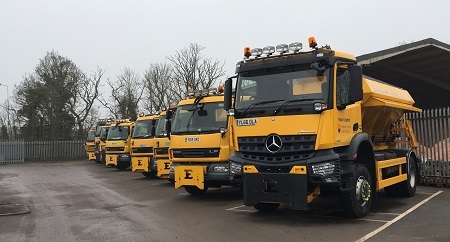 The Council’s Cabinet Member for Environment, Councillor Karen Shore said: “The Council works around the clock to keep the borough moving as safely as possible in times of severe weather – gritting 40 percent of the whole network to ensure access on key roads. “When the fleet is mobilised it’s important that we grit within a specific time period which is why we target key roads. We can only grit so much of the network within a timeframe and we must concentrate our efforts on key routes that see the most use. “Gritting updates are available via the Council’s Twitter feed. Search for the hashtag - #cwacgrit. Further information on gritting routes can be found on the Council’s website. More tips for being winter ready can be found on the Met Office website: http://www.metoffice.gov.uk/barometer/get-ready-for-winter.